Midweek with lots of productive venues nearby I decided to fish Lake Pier beach, principally to see if there were any flounder to be caught. However on arriving at the large car park I found that it was packed! Apparently I had picked the one night a club match was taking place, one more thing to check before choosing a venue; tide, weather, water conditions, match in vicinity! After a quick chat with match organiser Steve Lawrence, he advised fishing further up the harbour towards Rockley park. This turned out to be a fortuitous move as I needed to dig my bait first before fishing and there was some good digging at my new spot which meant I was able to get enough ragworm for my session. Fishing the flood after low water I was hoping for that elusive first flounder. 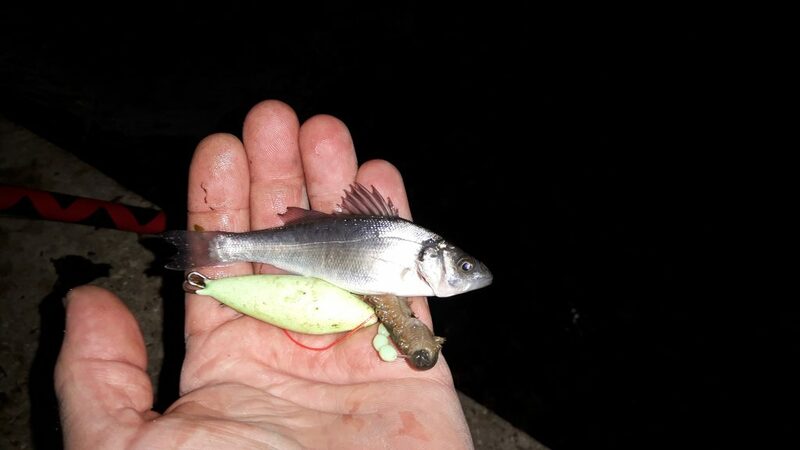 But as per usual on the flood tide the small school bass beat the flounder to the baits. Some of the bass were smaller than the ragworm I was using! You have to admire this Sea Bass’s ambition! At the weekend my long suffering pal Martin and I took the leftover ragworm along with some squid and sandeel to Southbourne. 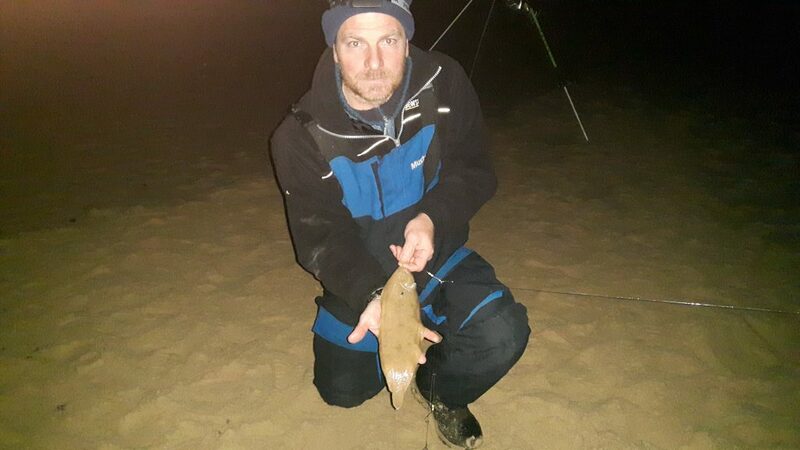 Martin was keen to chase the bigger stuff like rays,codling or bass on the squid and sandeel wraps. Whereas I was looking to pick up a sole with small ragworm and lug baits. 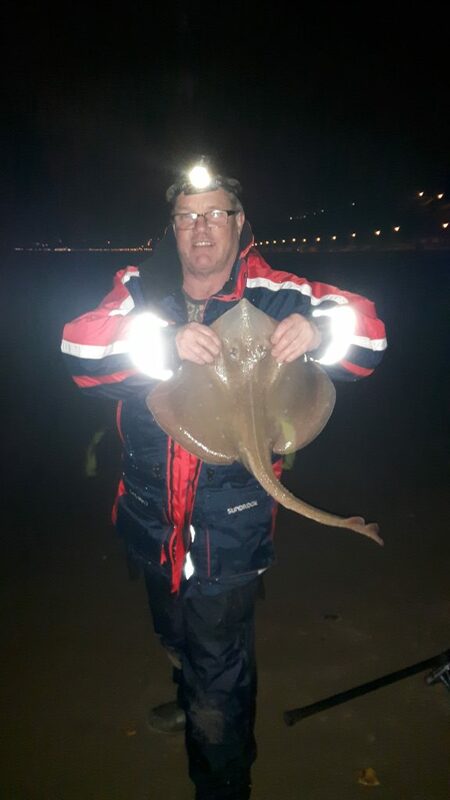 The tides weren’t ideal with the spring low tide at 10 pm but we arrived at the beach around 7pm and within a few casts Martin had a good rattle that produced a good little small eyed ray around 3lb. A few minutes later he landed another butterfly sized small eyed ray. It was quiet considering the good conditions and we had to wait quite a while for another bite. Around 9pm an hour before low water I had a small rattle that produced a very small slip sole. Another couple of hours passed then roughly an hour after low water, I had another rattle followed by another slightly larger sole. Then that was it no more fish. Not one of our best nights however Martin had set out to catch ray and had caught two and I had targeted sole and also caught two. No monsters granted. But target species accounted for!! Checking out the social media for that weekend Many people did much better than us, with better ray and some bonus turbot also caught. In particular some good blonde rays to double figures. Worryingly however we did watch a trawler working offshore up and down the length of the beach all night. 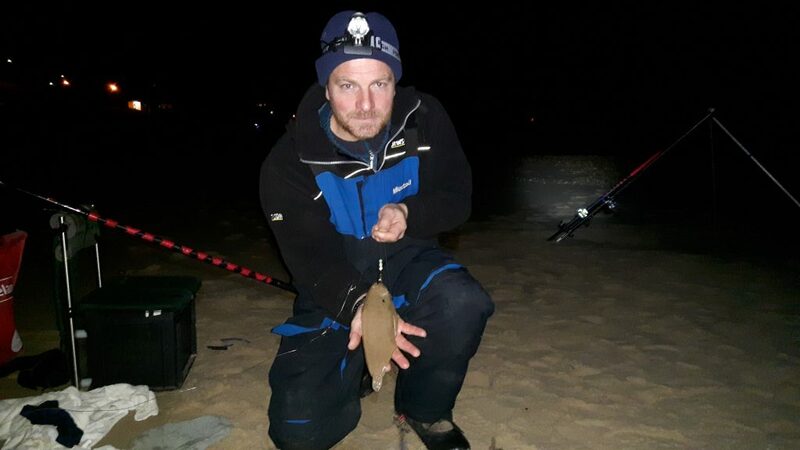 Providing those commercial boys give us a break, Southbourne will continue to produce some better than average ray, cod and whiting as the season continues. This weekend saw me fully employed as dad’s taxi having to drop family members to their respective Halloween parties. Deliveries made I had a three hour window to catch a fish! So no deliberation about where might be best venue given the current conditions it was straight to the nearest beach which happened to be Sandbanks. This time I had pre dug some ragworms in the afternoon so it was straight down to fishing! 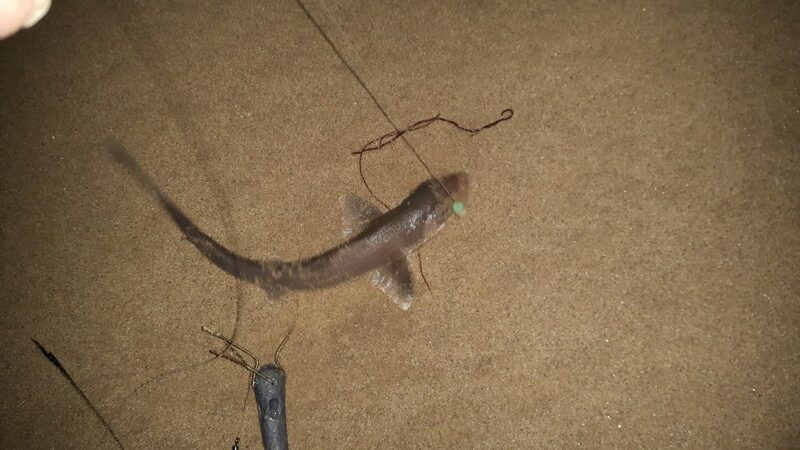 Arriving around 7pm I set up two rods for sole and one with sandeel squid wrap for rays or anything else bigger. I had a window of three hours to catch a fish. After two hours I was still fairly confident. After two and a half hours without a bite I was concerned. With 15 mins to go to before packing up I had pretty much conceded the night was going to be a blank. Reeling the rods in for a rebate and the obligatory last cast I found both sole rods had small smoothhound pups dangling on the end. Not what I wanted to see as at that size they are a nuisance. 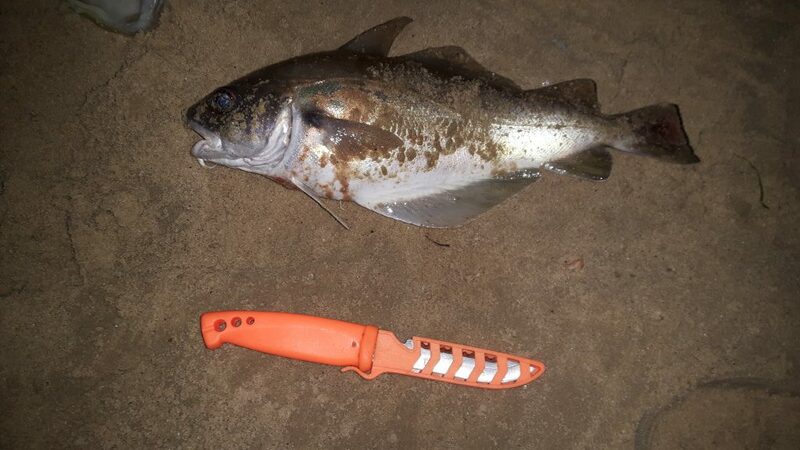 The last cast on the squid wrap however produced one of the biggest pouting I have seen from the beach in years. At nearly 2lb in weight it had huge shoulders and was packed with meat so I never went home fishless after all. Wrapped in tin foil and cooked with chilli flakes, it was delicious. It was as was easily as good as any cod of the same size with a slightly more delicate flesh. The Power of The Last Cast! In the next few weeks the flounder fishing should really start kicking off in the harbour. I have already dusted off my rigs loaded with bling in preparation and look forward to chasing that elusive 5 pounder! Some good flounder have already been caught so hopefully this points towards a good season as the weather gets colder. 6 Responses to "Last cast Pouting"
I would also like to try for a few flounders in poole harbour. Where would you suggest would be a good place to start .? Almost anywhere around Holes Bay. Lake Pier area, Hamworthy Park- though the car park closes at dusk and you should park on the road. Baiter is also good, as is Evening Hill, Sandbanks. Lake pier beach would be the place I would go. I have given directions for this venue in my first ever post is wrote about flounder fishing in Poole Harbour. I will try lake pier area first then . Hopefully this Sunday . I am new to the area and new to fishing. Local tackle shops have been very helpful in explaining about tides, places to fish etc. Your website gives me the practical advice. But this report confuses me. I’ve been told to fish incoming Spring tides, and in Bournemouth the highs are always in the mornings and the evenings. For Neap tides I’ve been told it doesn’t matter so much what tide you fish. I have looked in my Tide Table book, and the weekend you were fishing was (as I’ve been told before) High Tide late evening. Your report says it was Low Tide at 10, but it must have been High Tide at 10 p.m. You arrived at 7p.m. Although you say it wasn’t ideal fishing an outgoing tide, wasn’t it an incoming tide? I am now confused. Sorry.